A lovely original Woman’s Realm 1950s Dress Pattern, style number L19. This pattern dates to around 1956 and comprises of two styles; dress with full skirt and dress with straight skirt. There are 11 pieces in the pattern in total, as well as instructions for how to create the items. This is approximately a modern UK size 10. Condition: Complete and in good condition with some signs of wear on the packet. 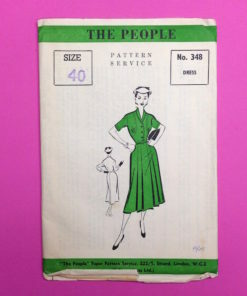 These old dress patterns illustrate the best, classic looks of their time. Creating custom dresses based on vintage patterns using your own materials is a really satisfying way to customise your wardrobe. You can be certain no one else will have anything like it!